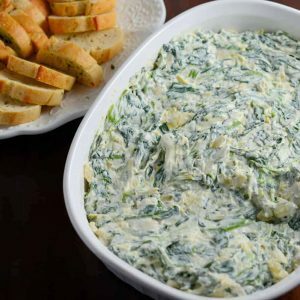 Creamy Spinach Artichoke Dip is the perfect party appetizer. Make ahead and serve chilled or hot with crackers, crostini or vegetables! In a large mixing bowl or the bowl of a stand mixer fitted with a paddle attachment, blend cream cheese and mayonnaise until smooth. Using a tea towel or heavy duty paper towels, squeeze as much moisture out of the spinach as possible, until it is near dry. Add spinach and coarsely chopped artichoke hearts and remaining ingredients, blend until combined. Transfer mixture to a serving dish. Cover and refrigerate for 1 hour. Serve cold or if you prefer yours hot, sprinkle with Swiss cheese and bake at 350 degrees for 15 minutes or until cheese is bubbly.